Welcome to the Contemporary Floral Tapestry Collection. Finely woven on Jacquard looms using pure cotton yarns, these tapestries are supplied fully lined incorporating rod pockets for hanging purposes. Created for today's interiors with a new contemporary look with the timeless tradition of tapestry. 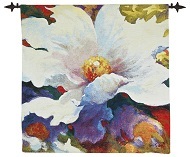 A unique tapestry for the contemporary home. Woven : Flanders, France/Belgium border.